New Jersey's official designation as "the Garden State" had a somewhat bumpy evolution. According to one account, the term may have been first used by Abraham Browning, an attorney, politician, and owner of the Cherry Hill Farm whose name later was adopted by the municipality. Browning is said to have used "Garden State" in referring to New Jersey while speaking at the Philadelphia Centennial exhibition on New Jersey Day (August 24, 1876). In justifying the description, Browning went on to say that New Jersey was an immense barrel (a metaphor also used earlier by Benjamin Franklin in referring to New Jersey), filled with good things to eat and open at both ends, with Pennsylvanians taking from one end and New Yorkers from the other. In 1954, however, when the state legislature passed a bill to have "The Garden State" added to license plates, Governor Robert Meyner vetoed the legislation, explaining his rejection on the basis that he had found "no official recognition of the slogan Garden State as an identification of the state of New Jersey." He added, "I do not believe that the average citizen of New Jersey regards his state as more peculiarly identifiable with gardening or farming than any of its other industries or occupations." Despite the Governor's objections, the legislature overrode the veto, with the slogan soon added to license plates and later widely used in state marketing campaigns as an official nickname. Over the years, arboretums which were initially planted by wealthy private landowners have increasingly come under ownership and operation of state, county and local governments, sometimes incorporated as part of larger parks and recreation areas. In a few cases, however, nonprofit philanthropic foundations, sometimes funded with endowments established by their original patrons, continue to bear the substantial operating costs of arboretums and gardens. Often,nonprofit organizations or garden clubs assist with fundraising or provide volunteer help with tasks of planting and maintenance. 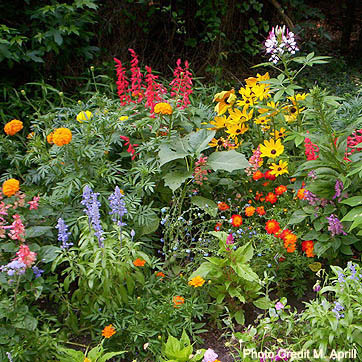 Several public gardens in the state have formed the nonprofit association Garden State Gardens, which promotes public awareness of arboretums and gardens through such activities as sponsoring a web site with profiles and links to its members; organizing an annual theme-based event highlighting collections of individual public gardens; and maintaining a speakers bureau. The following profiles some of the larger arboretums and gardens in the state open to the public. Property now operated as part of ﻿﻿Ringwood State Park﻿﻿, including New Jersey Botanical Garden of 96 acres of specialty gardens surrounded by 1,000 acres of woodlands with miles of marked trails. Settings include a Lilac Garden, Magnolia Walk, Wild Flower Garden, Crab Apple Vista, allée of 166 trees extending nearly a half-mile, and Perennial Garden. Winter Garden with New Jersey's largest Jeffery pine, features weeping beech beside century-old upright beech, as well as Japanese umbrella pine. Land previously owned commencing 1892 by prominent New York lawyer and friend of President Grover Cleveland, Francis Lynde Stetson, who built home and began planting extensive gardens. After Stetson's death, property sold in 1922 to Clarence McKenzie Lewis, a stockbroker and civil engineer and stepson of William Salomon, a founder of Salomon Brothers Wall Street investment banking firm. Lewis demolished original Stetson house and built new 44-room mansion designed in style of British manor house by distinguished American architect John Russell Pope, whose projects included National Archives and National Gallery of Art. State government purchased property in 1966. Open daily throughout year without admission fees, public tours conducted selected Sundays, house and grounds also available for rental for weddings, receptions, other events. 650-acre privately-owned reservoir surrounded by a 290-acre Environmental Preserve and 2,000 additional acres of woods and fields. Reservoir provides stored water that can be released to Delaware River to make up for evaporation from water usage at certain electric generating units in times of low flow in river. Bird feeding/wildlife viewing area located outside Visitor Center with demonstration butterfly/hummingbird garden. One of largest collections of herbs and perennials in country, most available for purchase. Selection of over 1,900 rare and common varieties, including basils, lavenders, thymes, geraniums. Features brick path through butterfly, herb, medicinal, perennial and rock gardens. Established 1966 with purchase of property in Sussex County mountains by husband and wife, Cyrus and Louise Hyde, nationally known horticulturalists, remains owned and operated by them and family. Gift shop with dried flowers, wreaths, potpourri, books including cookbook written by Louise Hyde, Favorite Recipes From Well-Sweep. Open year-round Monday through Saturday. 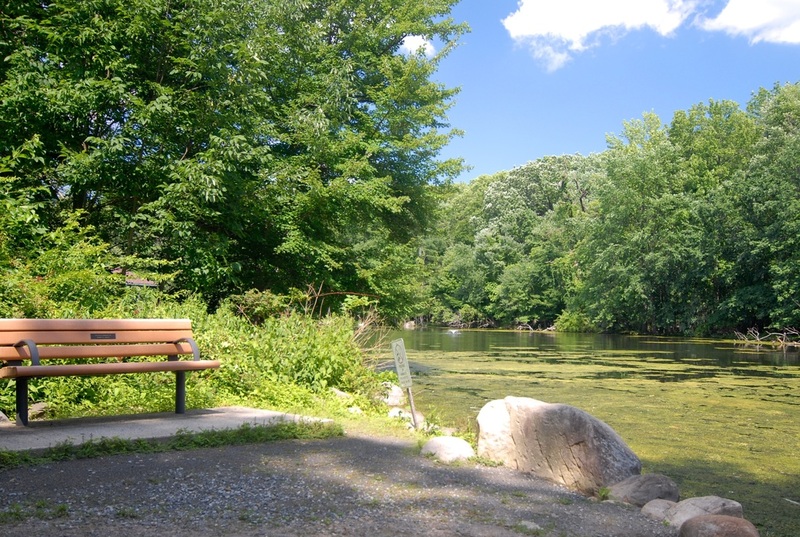 Located between towns of Hackettstown and Washington accessible from I-78 and I-80. Originally an 81-acre pig farm, property purchased in 1962 by Bergen County, named in 1987 as McFaul Wildlife Center in honor of longtime Bergen County Parks executive director, James A. McFaul and 1990 name changed to James A. McFaul Environmental Center. to better reflect park’s programs. Site includes a waterfowl pond, bird shelters, a boardwalk, nature trail, memorial gazebo, and natural science exhibits. Gardens include specialties such as flowering trees, Daffodil Hill, rhododendrons, ornamental grasses, the herb garden, a secret scented garden, and various memorial plantings. Naturalized field area and woodlands with many plant species providing habitat for variety of wildlife species, including insects, birds, and mammals. Wetland forest with perennial, shade, azalea and grass gardens, lawns, and an allee of Kousa dogwood trees. Spring fed pond with fountain and aerators stocked annually with fish. Section of arboretum, a bird sanctuary. Site purchased by Borough of Glen Rock in 1954, nonprofit Friends of the Glen Rock Arboretum volunteer organization aids preservation, maintenance and development of arboretum. 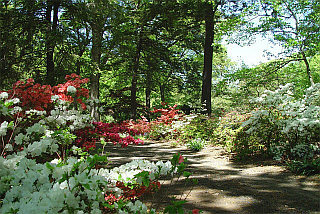 Image: Friends of Laurelwood Arboretum, Inc.
30-acre property features gardens, wildlife, two ponds, streams and hundreds of varieties of rhododendrons, azaleas and other species of plants and trees connected by gravel paths. Once a commercial nursery, acquired by nearby residents John and Dorothy Knippenberg in 1940s and 1950s, donated to Wayne Township after their deaths, now maintained as public park through partnership between Township and non-profit organization Friends of Laurelwood Arboretum. Knippenberg Center for Education and adjoining Educational Greenhouse dedicated in 2015 provides space for educational programs and community activities. Open daily 8 a.m. to dusk. Mansion built 1740-1750 by Dutch-born planter Dirck Dey, later served in summer and fall of 1780 as headquarters of George Washington. Passaic County Park Commission bought Mansion in 1930. Re-opened to public in 2016 after extensive renovations, including of formal garden and herb and vegetable gardens surrounding structure maintained by Riverview Garden Club. Located on Preakness Valley Golf Course in Wayne, also served as the meeting place for organizations such as the Daughters of the American Revolution, the Sons of the American Revolution, the Children of the American Revolution and Colonel Pawling's Independent Corps Levies. Located within 4,000+ acre state-owned Pequest Wildlife Management Area operated by Division of Fish and Wildlife of Department of Environmental Protection. Pequest Trout Hatchery raises more than 700,000 brook, brown and rainbow trout for stocking in state waterways each year. Natural Resource Education Center includes exhibit on creating backyard wildlife habitat. 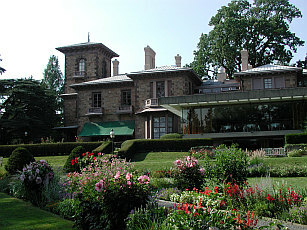 Suburban estate on six acres with an Italianate Villa originally owned and developed by three generations of Van Vleck family, including Howard Van Vleck, who studied scientific aspects of horticulture and known for developing hybridized rhododendrons to create a clear, yellow-flowering variety, with some of his hybrids surviving in current gardens. Owned since 1993 by Montclair Foundation. Located at the base of 7 1/2 acre Mountainside Park, iris gardens contain over 10,000 irises of approximately 1,500 varieties and produce over 100,000 blooms over the course of season. Gardens started as memorial to Montclair resident Frank H. Presby, one of founders of American Iris Society and an iris hybridizer. After Presby's death, gardens initially planted in 1927 by volunteers of Montclair Garden Club, site currently maintained by nonprofit Citizens Committee of Presby Memorial Iris Gardens of Montclair, Inc. Maintained since 1952 by Garden Club of Montclair behind United Way building near center of town. 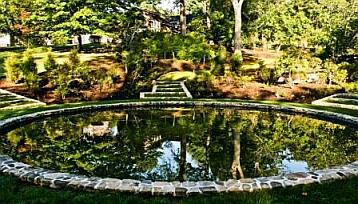 Originally designed by Club founder late Avis Campbell, landscape designer. ''Wheel of Life'' layout, with stone fountain at hub. Features roses, including some surviving from original Avis Campbell plantings, as well as foxglove, peony, columbine and quince. Over 16 acres of woodlands, 3 miles of trails, and diverse floral species. Property originally part of large tract which Stewart Hartshorn, wealthy inventor and manufacturer of self-acting window shade roller, acquired and developed as planned community which evolved as Short Hills. 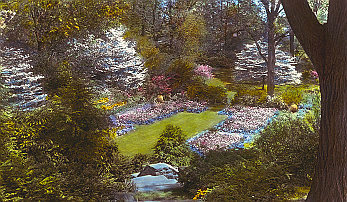 Hartshorn's daughter Cora created arboretum commencing in 1923, with emphasis on plant species indigenous to New Jersey. “Stone House” built using trap rock from Hartshorn-owned quarry in Springfield and completed in 1933. Cora Hartshorn bequeathed property upon death in 1958 to Millburn Township. Arboretum Association formed 1961 to work with Township to maintain gardens and buildings, including kitchen and lab facility, bird observatory, and office space. Located in Grasmere Park, owned by Town of Maplewood since 1977. 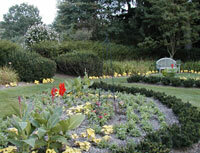 Gardens include colonial herb garden and children’s garden. Historic house whose original structure was built around 1790, sits on two acres of original plantation which was part of 72-acre tract of land acquired by Ebenezer Hedden before 1740. Initiated in 1927 by local resident and member of Shakespeare Society as garden planted by Plainfield Garden Club to include some 44 flowers and plants mentioned in Shakespeare's works. Park Commission retained Olmsted landscaping firm of Boston, successor to firm headed by Frederick Olmsted, designer of Manhattan's Central Park, which designed layout of beds framed by brick edges as formal English garden, with many of original plantings imported from England. Labels placed in beds with botanical and folk names, and quotations from Shakespeare, other authors about the flowers. Later additions included rock garden, rose beds, arbor and variety of trees including holly, mulberry, yews. Listed since 2007 in National Register of Historic Places. Located within Cedar Brook Park operated by Union County Park Commission which includes lake, athletic fields, tennis courts, picnic tables. Historic estate and gardens comprising 13.5 acres representing design trends by prominent landscape architects of late 19th and early 20th centuries. Property once a Lenni Lenape Native American trail from coastal areas near Elizabeth to Schooley's Mountain in northwest. During Revolutionary period, adjacent to Old Sow Revolutionary War Cannon and Signal Beacon atop Beacon Hill.In 1889, acquired by John Hornor Wisner for country estate known as 'The Clearing," built colonial Revival residence, presently administrative center and site for art exhibits known as Wisner House. Wisner commissioned Calvert Vaux, a partner of Frederick Law Olmsted in creation of Central Park, to design landscape, which included first clusters of daffodils that are now major Arboretum attraction. In 1916, property sold to new owners, Mr. and Mrs. Richard Reeves, who expanded daffodil collection, added 1925 rose garden with connecting rock-pool garden. In 1968,Charles L. Reed family became last private owners, adding patterned herb garden and opening woodland trails. In 1974, local citizens, including Reed family, raised funds along with municipality of Summit to preserve estate as arboretum open to public. Features June to October Art in the Garden outdoor sculpture exhibit; Sounds of a Summer Night concert series. Listed on national and state Registers of Historic Places. Arboretum grounds open to visitors from dawn to dusk daily, Free admission, $5 suggested donation per visitor. On Drew University campus, created in 1980 and named in honor of Drew botany faculty members Robert and Florence Zuck. 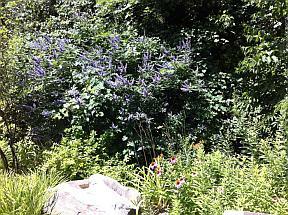 Incorporates two glacial ponds, mix of native and introduced trees, and variety of flowering plants and shrubs. Ponds home to turtles, goldfish, catfish and muskrats and stops for migrating Canada geese, ducks and herons. Its rare and irreplaceable resources serve as an outdoor laboratory to enhance students education. Dedicated in 1971 as Morris County park following 1969 bequest by Matilda Frelinghuysen, who inherited 127-acre farm and summer estate of wealthy parents George G. Frelinghuysen, a patent attorney and son of Frederick T. Frelinghuysen, Secretary of State under president Chester A. Arthur, and former Sara Ballantine of Newark, granddaughter of founder of P. Ballantine Brewing Company. Located near Whippany River, Colonial Revival mansion remains on property, now headquarters of Morris County Park Commission. 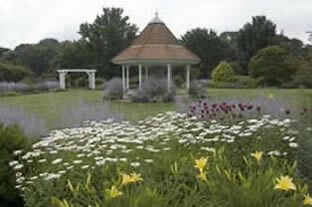 Linder Perennial Garden includes numerous asters and chrysanthemums; Knot, Rose, Fern and Shade gardens. Cafe on site. Maintained by nonprofit Friends of Frelinghuysen Arboretum. 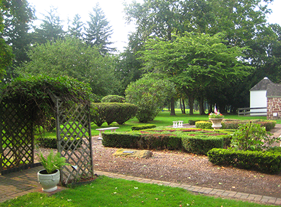 Gardens on property of Macculloch Hall Historical Museum, which holds largest single collection in US of original drawings of American political cartoonist and Morristown resident Thomas Nast (1840-1902). Mansion built in 1810 by George and Louisa Macculloch on 26-acre parcel of land. Museum archives include family records of garden plantings, including traditional kitchen garden as well as apple and pear orchards. George Macculloch (1775-1858) believed to have grown first recorded tomato in New Jersey in 1829, kept meticulous journals. Highlights of garden include wisteria trellised along rear porch given to Maccullochs by Commodore Matthew Perry in 1857; sundial on upper lawn installed in 1876; sassafras tree at far end of lawn believed to be second oldest and largest sassafras tree in New Jersey; and more than 65 varieties of heirloom roses dating before 1920. Beginning in 1950s, Museum founder W. Parsons Todd (1877-1976) engaged Garden Club of Morristown to replant Macculloch Hall’s gardens, complementing originals plants with selection of perennials. In 2015, Museum installed kitchen garden to serve as an outdoor classroom planted with herbs and tomatoes. Gardens open free to public daily, 9:00 am-5:00 pm; Museum $8 adults, $6 for seniors and students; $4 for children under 12; free for under 5. Formal gardens include Pan’s Garden, Cottage Garden and Rosarie, also features informal paths through open areas and woodlands. Property originally acquired as farm in 1908 by brothers Robert and Henry Tubbs, who formed close friendship commencing in 1930s with Benjamin Blackburn, horticulturist on faculty at Rutgers College of Agriculture and later at Drew University. Blackburn moved to reside on property, assisted Tubbs brothers with collecting and growing distinctive plants, many existing specimens date from their initial plantings. Property bequeathed in trust to Blackburn upon death of last surviving Tubbs in 1958. Morris County Park Commission took legal control of property in 1980, with Blackburn remaining in residence as custodian until his death in 1987. Gardens and trails open daily dawn to dusk, free to public. Project of New Jersey Historical Garden Foundation in cooperation with National Park Service, located on Cross Estate, site of New Jersey Brigade Unit of Morristown National Historical Park. Property originally part of early 20th century estate of Cross family, acquired in 1970s by National Park Service. 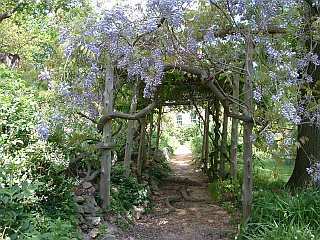 Gardens comprise formal and native gardens and mountain laurel allee. Walled garden pergola features 19 stoned columns with blue and white wisteria and male kiwi vines. 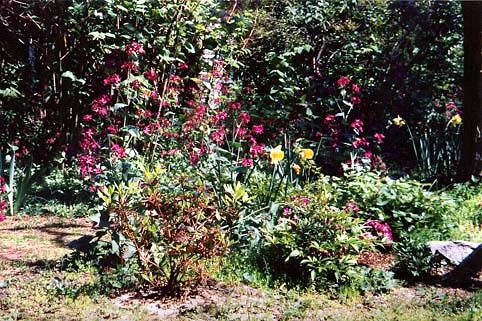 Other gardens include lawn garden, with native rhododendrons, primroses, and perennials; fern garden, site of dawn redwood. Open from dawn to dusk. No entry fees. 100-acre farm and former home of Martha Brookes Hutcheson, one of America’s first female landscape architects and author of books in 1920s on garden design. Design influenced by classical Italian gardens, featuring pond enclosed by native plants, vegetable garden, flower borders, orchards, allées, and farm buildings. Donated in 1972 by Hutcheson daughter to Morris County Park Commission, now part of larger network of over 1,000 acres of preserved County parkland along Black River and adjacent areas. Open daily 8 AM to sunset throughout year. 33 acres of woodland, streams, rock outcroppings and walking paths, considered one of premier rock gardens in eastern US. Begun in late 1930's by Leonard J. Buck, who developed naturalistic garden as part of his estate, donated to Somerset County Park Commission by Mrs. Helen Buck in 1976. Gardens designed to depart from formal, man-made look of 19th and early 20th century landscape designs and follow natural rockscapes and other features with native plantings. 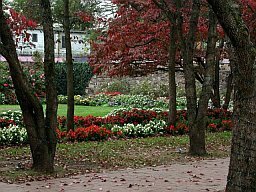 Consists of series of alpine and woodland gardens situated in wooded stream valley with several large rock outcroppings. Rare and exotic rock garden plants along wooded trails lined with wild flowers and ferns. Base of valley walls planted with azaleas and rhododendrons. Open 8 am to 8 pm on Wednesdays (May through August); closed on weekends and major holidays in December, January, February, and March. Comprised of a series of horticultural collections arranged in garden settings and spread over fifty acres on Rutgers Cook College campus. 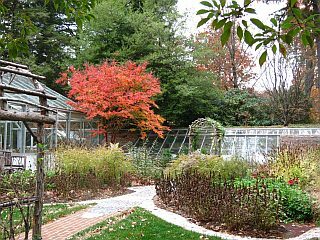 Oldest garden dates to 1927, features variety of landscape plants with origins around globe, but with special emphasis on cultivars for New Jersey habitats and weather conditions. Collections include Donald B. Lacey Display Garden featuring award-winning flowers and vegetables, one of largest US collections of American Hollies, Shrub Collection, Shade Tree Collection, Rhododendron and Azalea Garden, Roy H. De Boer Evergreen Garden, Ella Quimby Water Conservation Terrace Gardens, Gardens for Sun & Shade, Ornamental Tree Collection and Bamboo Forest. Gardens adjoin Frank G. Helyar Woods (virgin forest with marked trails), Weston's Mill Pond and Log Cabin & Pavilion on 92-acre pond. Open daily throughout year, no entry fee, available for special event rentals and programs. Operated by City of New Brunswick as part of 78-acre Buccleuch Park on Raritan River. Mansion originally built in 1739 by Anthony White, son-in-law of Lewis Morris, a colonial governor of New Jersey, donated to City in 1912 and opened as museum in 1915. Gardens include rock garden, flower garden, and gazebo. Nearby playing fields and picnic pavilion. One of largest privately-owned parcels of undeveloped land in New Jersey, 2,740 acres owned and supported by Duke Farms Foundation, an operating foundation of Doris Duke Charitable Foundation. Former private estate created commencing 1893 by tobacco millionaire J.B. Duke, who acquired over 2,000 acres of farmland and woodlots, building mansion and excavating nine lakes, installing some 35 fountains and many pieces of sculpture. Duke's daughter Doris Duke (1912-1993) inherited property, became friend of Pulitzer Prize-winning author and scientific farmer Louis Bromfield, in New Jersey she planted interconnected gardens with each a full-scale re-creation of a garden theme, country or period, inspired by DuPont's Longwood Gardens. Duke also became nationally known as orchid cultivator with existing Orchid Range greenhouse first ornamental building constructed at Duke Farms, styled in form of a palm house, houses a Subtropical Display and a Tropical Orchid Display focusing on plants native to US. Sponsors range of public programs on ecology, landscaping, wildlife, habitat restoration. Original mansion demolished 2016, subject of controversy over efforts by local conservationists to preserve structure. From November 1 to March 12, Orientation Center and Duke Farms open six days a week Thursday through Tuesday 8:30 am to 4:30pm; from March 13 to November 5, open six days a week Thursday through Tuesday from 8:30am to 6:00pm; closed to visits on Wednesdays as well as Thanksgiving, Christmas Day and New Years Day. 144-acre Arboretum in western section of Colonial Park operated by Somerset County Park Commission. Living tree museum contains labeled specimens of flowering trees, evergreens, shade trees, dwarf conifers, flowering shrubs and ornamental trees and shrubs. Various types of dwarf conifers. Also located nearby are Fragrance & Sensory Garden designed to be of interest to visually or physically impaired visitors, Ornamental Grass Collection, Perennial Garden, Rudolf W. van der Goot Rose Garden, and Shrub Collection. 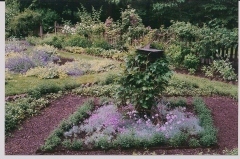 Gardens planted behind Prospect House on Princeton University campus, former official residence of University presidents, since 1968 a faculty dining club. Originally a model farm, house purchased in 1824 by John Potter, wealthy merchant from South Carolina. Son Thomas F. Potter demolished original Georgian farmhouse and replaced it in 1851 with present Italianate villa with extensive garden designed by prominent architect John Notman. Acquired in 1878 by Robert and Alexander Stuart of New York, who donated house and 35-acre property to College of New Jersey (now Princeton University), for use as residence for school's presidents, including Woodrow Wilson who lived in house when president of University between 1902 and 1910. In 1968, residence for presidents relocated to Walter Lowrie House off main campus, with Prospect converted for use as faculty club for dining and receptions. Gardens open to public. Former private estate of Frederick Sayen, avid gardener and world traveler who in 1912 purchased 30- acre parcel of land just south of Trenton not far from family rubber mill in Hamilton Square. Collection includes species from China, Japan and England, over 1,000 azaleas and nearly 500 rhododendrons with some 250,000 flowering bulbs. Holds annual Mother's Day Azalea Festival. Walking trails, fish ponds and gazebos throughout grounds. Owned and operated by Hamilton Township, house and garden available for rentals for weddings, other special events. 42-acre sculpture park located on site of former New Jersey State Fairgrounds near Trenton, opened to public in 1992 and operated by nonprofit foundation. Founded by sculptor and Johnson & Johnson heir J. Seward Johnson, Jr., with goal of making contemporary sculpture more widely accessible to public. Sculptures displayed in gardens on extensive park grounds and indoor museum include over 270 works, some commissioned specifically for park. On-site restaurant Rats﻿﻿﻿﻿,﻿ named for character "Ratty" in The Wind in the Willows--Seward Johnson's favorite childhood story book--styled on theme of fairy tale and Monet's impressionist art. Tickets adults $18 at gate $16 online; seniors $15 at gate, $13 online; students aged 6-17 $10; children under 5 free. Open Tuesday-Sunday 10 AM-6 PM and until 9 PM Fridays and Saturdays. Operated by Monmouth County Park System, 54 acres of gardens and greenhouses focused on plantings compatible with home gardens. 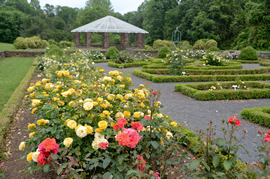 Parterre features 52 varieties of roses with over 180 bushes. Formal terrace garden designed to reflect those at Versailles with colonnade and fountains. 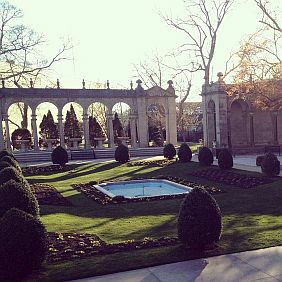 Located behind Woodrow Wilson Hall on campus of Monmouth University, formerly known as Shadow Lawn mansion built 1929 by F.W. Woolworth Co. president Hubert Templeton Parson and family. Wilson Hall listed in National Register of Historic Places and designated National Historic Landmark. 22 acres within Holmdel Park established in 1963 by Monmouth County Park System, named for former Monmouth County Shade Tree Commission superintendent. 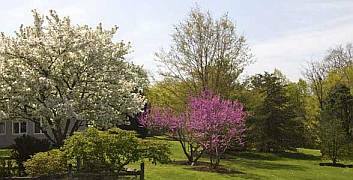 Contains hundreds of species, cultivars and varieties of ornamental trees and shrubs with educational programs focused on those compatible for growth in Monmouth County. On campus of Georgian Court University, former estate of George Jay Gould, millionaire son of railroad tycoon Jay Gould. Noted architect Bruce Price hired to transform land purchased in 1896 into country estate resembling an English estate of Georgian period. Arboretum established 1989 named after Sister Mary Grace Burns and comprises some 100 acres of campus. Collection includes over 2,200 woody plants from over 200 species, representing most of native species of New Jersey Pinelands, as well as many nonnative plants. Named to Best College Reviews list of 50 Most Beautiful College Arboretums in 2015. Open daily 8 am to dusk without charge. Property dates to colonial-era dam, grist and saw mill, with adjacent house and village. Land acquired 1975 by Burlington County for development as the County's first park. Mansion,and village listed on New Jersey and National Registers of Historic Places. Open for public tours May through October on Wednesdays and Sundays, and for three weeks in December for Victorian Christmas when rooms are decorated by local garden clubs and other interested groups. 32-acre property with farmhouse built in 1816 by Quaker farmer, Joseph Thorn. Illustrates agrarian lifestyle once dominant in South Jersey. Listed on National and New Jersey Registers of Historic Places. Owned and operated by Cherry Hill Township. Open Wednesdays, 12-4 PM, 1st Sunday of month, 12-4 p.m. Closed December-March. Free for Cherry Hill residents and children 12 and under, others $5; $3 for seniors and students 13 and over. Surrounds Barnegat Light Museum which includes artifacts of nearby Barnegat Lighthouse. 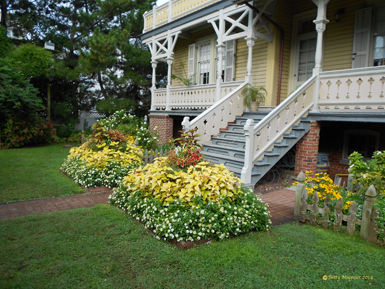 Maintained by Long Beach Island Garden Club, established by late local gardeners Edith Duff Gwinn and Frances Selover. Museum open 10 AM-4 pm daily July and August, weekends in June and September; Garden open during daylight hours. Comprises over 200 acres on campuses in Medford and Lumberton of public gardens, collections, and preserved natural areas. Grounds part of Medford Leas Retirement Community established 1971 by The Estaugh, Quaker-related, not-for-profit corporation, as residential and healthcare community currently home to over 600 residents aged 55 and older, in 1981 designated entire acreage as arboretum open to public. 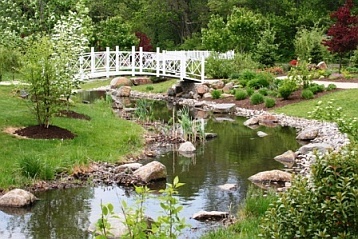 Includes designed gardens, landscaped grounds, meadows, natural woodlands and wetlands, and one of South Jersey's most extensive plant collections. Free for Individuals and small groups, special tours available for scouting groups, garden clubs. Largest annual garden in US. Created by Aprill family (who own and operate organic Thimblefull Farms, also on property) to preserve centuries old woodlands and wetlands. Rare native plants and trees, old oaks, hollies, and pines along with hundreds of cinnamon ferns and mushrooms, ponds with fish, eels, frogs, and turtles. Butterflies and dragonflies, hummingbirds in August. Open weekends in spring, daily in summer, closes after September 25. Admission $8 adults, $6 age 14 - 18, $5 age 5 - 13, free under 5. Butterfly garden demonstrates backyard habitat for butterflies and birds. Operated by New Jersey Audubon Society, which also conducts Monarch butterfly survey on site. Open daily 10 AM to 5 PM, free admission. Estate including main home built 1879 with Oval Garden on front lawn and Carriage House with rear herb garden. Property formerly owned by wealthy Physick family, Dr. Philip Physick of Philadelphia considered father of American surgery and inventor of several surgical procedures and medical instruments, home built by grandson Emlen Physick, a physician and real estate investor. Operated by nonprofit Mid-Atlantic Center for the Arts & Humanities. Self-guided tours $12 per adult; $8 child age 3-12. Image: Cold Spring Village, Inc.
Gardens in 30-acre village with 26 buildings re-created to reflect period 1789-1840. Farm with heritage crops. Village open seasonally and for special events throughout year, historically costumed interpreters and craftspeople demonstrate typical tasks and trades. Open Tuesday-Sunday (closed Monday) from June 28 through September 4th and for special events every weekend from June through September 10am-4:30pm. Walking Tours at $5 per person offered Tuesday-Friday from September 6–23 at 11 AM. Admission adults: $12, children 3-12: $10, children under 3 Free.